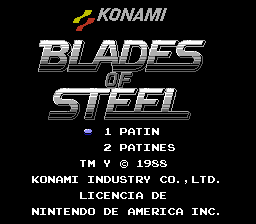 Blades of Steel is a hockey game released by Konami and is one of the few NES titles to feature digitized voice samples. 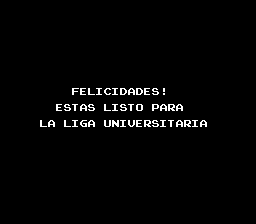 Although it can be a little difficult to make out what the voice says, it still gives the game class. Players can engage in either a single game (Exhibition) or play a tournament. There are three skill levels available: junior, college, and pro. 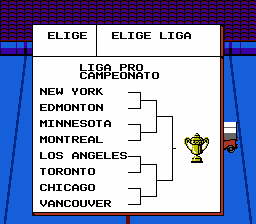 While there are eight different teams to choose from, their only differences are the city names and uniform colors. Each game begins with the players circling around their half of the icerink and the game begins with the face off and the action begins. The game is fast paced and simple to play. Each time the puck is passed the voice sample plays, “get the pass!” One of the most fun features is the game is when two players from opposite teams get into a scuffle a brief fight can start and the loser of the fight loses the puck. Shooting in this game requires some timing as there is a little red arrow going up and down at each goalpost. This arrow determines where a puck that has been shot will enter the goal. 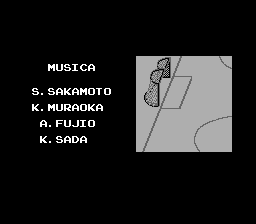 One of the most clever things in the game is sometimes in between periods the scoreboard displays scenes from other Konami games. 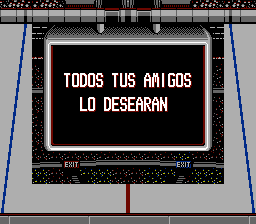 Translation to Spanish for “Blades of Steel” for NES.